The impressive Chrysler 300 has a distinguished pedigree. Classic styling blends seamlessly with modern design advances trend to create a stunning fusion of power, luxury and everlasting style. It's available for you to test drive now at Southern Norfolk Airport Dodge Chrysler Jeep RAM. Available in 5 trims: Touring, Touring L, 300S, Limited and 300C, the 2018 Chrysler 300 can be equipped with standard rear-wheel drive or optional all-wheel drive. The Touring, Touring L, 300S and Limited trims have a standard 292-horsepower 3.6L Pentastar® Variable Valve Timing (VVT) V6 engine. The 300C features a standard 393-horsepower 5.7L HEMI V8, which is also an available choice in the 300S. 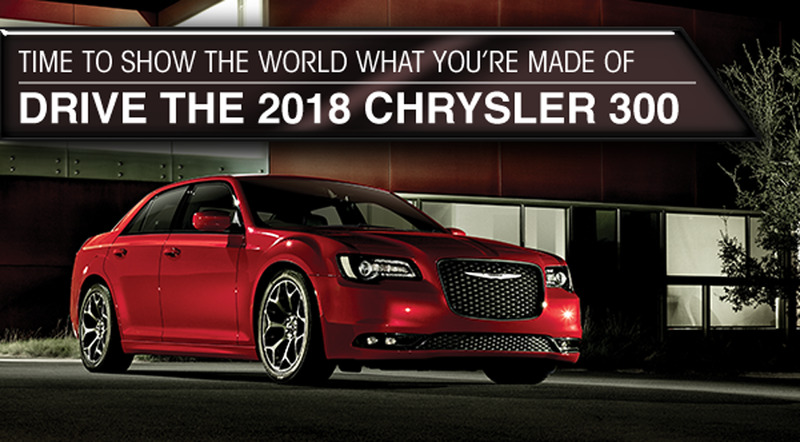 The 2018 Chrysler 300 is loaded with leading edge technology like the full-color 7-inch Driver Information Display (DID) that allows you to personalize the information you want to see, including audio, speed, compass, temperature, fuel economy, trip, cruise control, vehicle status and engine performance. It all adds up to over 7,000 available driverconfigurations. The 2018 Chrysler 300 features over 80 standard and available safety and security features to ensure you arrive safely. You waited long enough. It's time you moved up to the full-sized sedan you've always deserved. Schedule your test drive at Southern Norfolk Airport Dodge Chrysler Jeep RAM today. Serving drivers in Norfolk, Hampton, Chesapeake, Portsmouth, Suffolk and Virginia Beach.